Lobez - a town in Szczecin Province, on Łobez Upland, on the Rega river. It is located at the eastern end of Szczecin plain and at the northern boundary of Drawsko lake district. Old Slavic sediment. 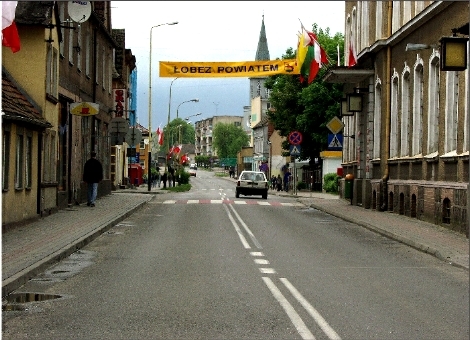 Łobez received city rights before 1295 from Borki's house. Later in the XIV century it also received Lubeck rights. An agricultural and craftsmanship center during the Middle Ages. XVII century was a period of the economic decline of the city. Since 1637 Łobez belonged to the Duchy of Western Pomerania. During the 30-year War (1618-1648) Łobez was conquered by the Swedes; since 1653 it was in the possession of Brandenburg. Łobez shared ups and downs of the Duchy of Western Pomerania. At the end of XVIII century small manufactories started to grow. In 1945 Łobez, seriously ruined, found itself within the borders of Poland. Population 10 961 ( as of 1999 ). Rega - a river with the lenghth of 179 km and catchment area of 2725 square km. It has its source in Drawsko Lake District, in the south-western part of Połczyn-Zdrój parish - vicinity of Toporzyk village - in the forests on the altitude of 177,5 meters above the sea level. The river belongs to direct catchment of the Baltic Sea. 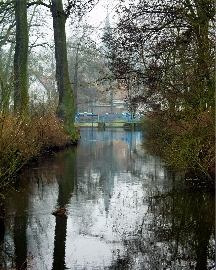 In the upper stream (distance of around 30 km) the river's decline is 4 meters, in the middle stream between 0,5-0,6 m, and in the down stream, down from the mouth of Mołstowa river - 0,3 m. There are six cities down the river float, convenient approaches and many places suitable for camping. All that makes planning of rafting trips much easier. Rega belongs to the most beautiful Polish kayaking routes. Every year there is an all-Polish rafting event organized - straight to the Baltic Sea. Rega's banks are mostly high and in many parts difficult to access. You may often encounter thick scrubs with branches leaning right above the water surface and many wet meadows in the river's vicinity. Even though Rega doesn't flow through major forest areas, it creates an impression of a typical forest river. The city and commune council of Łobez are located in the eastern part of Szczecin Province, on the river Rega. Łobez belongs to a group of cities which were the first in Western Pomerania to receive municipal rights based on the Magdeburg Rights. In the documents dated 1295 Łobez has already been mentioned as the city. Originally the medieval city was located on the river Rega. The owner and at the same time the founder of the city was a Pomeranian house of Borki. It has possessed other towns as well: Resko, Węgorzyno, Strzmiele and Starogard Łobeski. Until 1648 Łobez belonged to the Duchy of Western Pomerania, whereafter it has been ruled by Brandenburg. 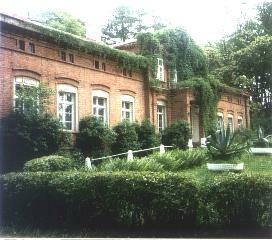 For centuries Łobez has been a service center for the immediate surroundings. During the Second World War the city was 70% destroyed. Liberation of the city took place on March 3rd, 1945. Until 1975 Łobez was functioning as an administrative district. Most probably in the future (once we wade through the new administrative division of the country) it will be a district city again. 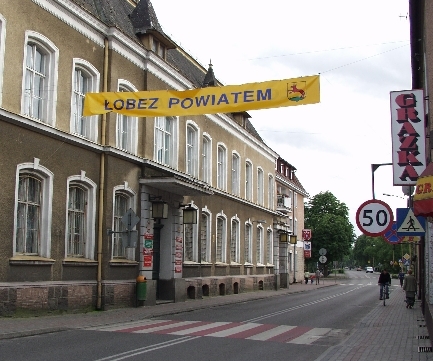 At the moment Łobez is a seat of the commune council. 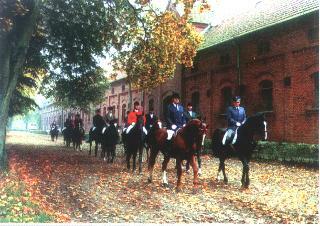 You can find in Łobez an antique church, as well as a stallion stable, well known in Poland and abroad. The renovations conducted in Łobez every year make the city even more beautiful and worth visiting. Numerous forests and lakes can become wonderful places for rest and recreation. The former inhabitants of Łobez, at present scattered across the whole Germany, have established very friendly relations with its present inhabitants. The forests of Łobez cover an area of around 21000 hectares. There have been two sanctuaries established here: "Kamienna Buczyna" (Stone Beech Wood) and "Mszar" (Morass) on the Piaski lake. You can spot here rare specimens of birds: erne (golden eagle), black stork and Aquila eagle. The river Rega, known for its rapid current, picturesque meanders, and trouts living in it, flows through the region of Łobez. It attracts the attention of anglers and kayakers. Rich hunting grounds are especially priced by hunters. Deers, roe-deers and wild boars can be hunted.